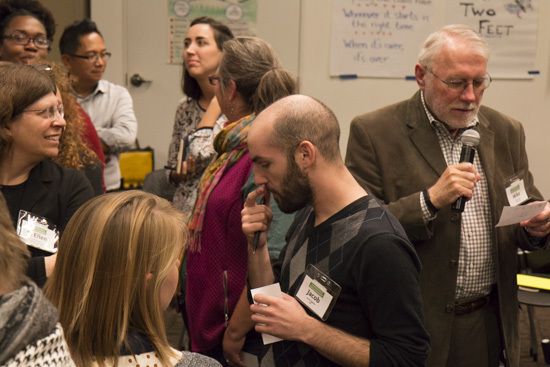 Conference participants share their final reflections at Experience Engagement. Photo by Emmalee McDonald. 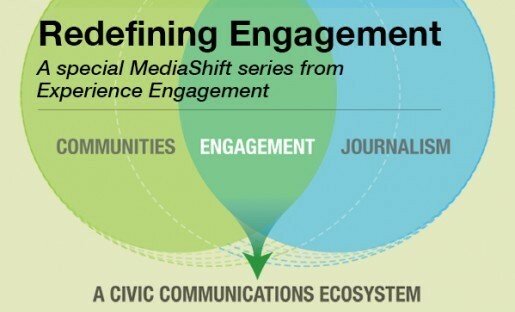 “Redefining Engagement” is a special 11-part series on the progress, promise and potential challenges of community engagement in journalism. The series, produced by the Agora Journalism Center, will be published in serial this month by MediaShift. Click here for the full series. Over the last two years, The Seattle Times’ Education Lab project has packed an auditorium to talk about school discipline, convened a powerful series of first-person storytelling events and integrated audience contributions into its reporting. The Education Lab is one of the most exciting applications of community engagement that exists in the legacy media, but there’s a catch: The project is primarily grant funded, so its long-term future is uncertain. For advocates of engaged journalism, perhaps the toughest lingering question is how to make community engagement work pay for itself. According to conventional wisdom, projects like the Education Lab are too time consuming, and therefore too expensive, to be a viable option for news organizations just trying to stay afloat. And while grant money is available to support certain experimental projects, there will never be enough funding to permanently sustain community engagement on an industry-wide (or even a newsroom-wide) scale. Some journalists believe the answer is to ditch for-profit media and instead create a more robust publicly funded alternative. These critics argue that if journalism is ever going to function as a true public service, then it will first need to be funded as a public utility, with taxpayers subsidizing the expensive but valuable work involved with community engagement. Ed Madison, center, participates in a breakout session at Experience Engagement. Photo by Emmalee McDonald. There are some compelling plans out there for how to scale up public funding for journalism (see: Robert McChesney and John Nichols), but even if we were to take the existing corporate media structure as a permanent reality, there’s actually still a strong case to be made for community engagement as a market solution. The crux of this argument is that, regardless of industry or sector, money flows from community. It’s why football fans pay hundreds of dollars to attend a football game instead of watching it on television, why comic book lovers pay big bucks to mingle with other superfans at Comic-Con events, why video gamers swallow a $15/month membership fee to go on “quests” with their guildmates in World of Warcraft and why Beats by Dre headphones sell for $200 or more when comparable (but less trendy and exclusive) models are selling for a fraction of the price. There are plenty of similar examples within journalism, like The Nation’s branded cruises, The Atlantic’s live event series, and, well, the very fact that people pay for news about what’s happening in their state, city and neighborhood. Indeed, community has always been at the heart of journalism’s business model. It’s just that in the Internet age, when community identification is less bound by geographic constraints, media organizations have to be more purposeful about building and cultivating it. The big-picture message that emerged from the Experience Engagement sessions is that successful, sustainable business strategies begin and end with engaged journalism that builds community around the news product. 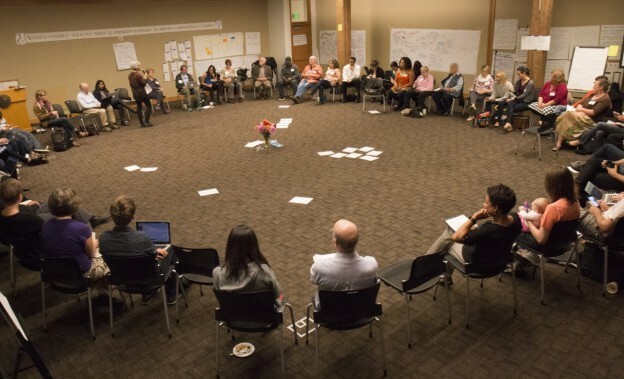 In one breakout discussion, participants addressed specific strategies that newsrooms can use to bolster that sense of community and turn it into a source of revenue. Here are four of the highlights. Traditionally, the newspaper subscription has been a transactional relationship, with media consumers paying a monthly fee to receive bundled news content on their doorstep (or, more recently, in their inbox). That fee used to account for only a small fraction of total revenue, but as advertising dollars have disappeared, subscription revenue has become the centerpiece of the newspaper business model. Participants at Experience Engagement discussed how community engagement could transform subscriptions into a product with more revenue opportunities: memberships. In a membership model, the source of commercial value isn’t access to a discreet news product, but rather access to some broader community that the media organization has cultivated, developed and branded. Receiving a daily, weekly or monthly print publication might be one perk of membership, but members will also be motivated by the chance to participate in a conversation, attend special members-only events, connect with other members online and advertise their membership to the world. Practicing community engagement helps create these market opportunities, whereas strictly publishing a newspaper does not. Of course, for the membership model to take off, media organizations first need to develop branded communities that prospective members feel compelled to buy into. And as any CEO or advertising executive can attest, building a brand doesn’t come cheap. According to Ed Madison, assistant professor of journalism at the University of Oregon, many media companies had it backward when they responded to the digital era’s financial challenges by slashing costs at every turn. He says the better approach is to invest heavily in newsroom innovation while doubling down on marketing, as successful companies in other sectors have done. Like subscriptions, memberships are monetized at the point of sale with a fixed monthly or annual fee. But for memberships, that fee isn’t the only revenue opportunity. Jo Ellen Green Kaiser, executive director of The Media Consortium, says members can turn into serial donors if media organizations make the right asks. Conference participants, including Jo Ellen Green Kaiser (far left) and Mike Fancher (far right), participate in one of the interactive activities at Experience Engagement. Photo by Emmalee McDonald. Kaiser says generic requests for support are less likely to succeed than targeted crowdfunding campaigns that promise a specific output. And she says the most successful campaigns ask for help funding a compelling story or reporting project rather than something purely functional like a redesigned website. The newspaper’s classifieds section was never a core function of journalism, but until eBay and Craigslist came around, it was a cash cow that helped support the editorial mission. One challenge addressed at our conference is how journalism can develop similar add-ons through community engagement. Among the most promising revenue opportunities are live events that monetize the media organization’s access to a particular community. There are already plenty of success stories. The Nation makes about $200,000 each year by selling tickets for its branded cruise; The Atlantic earns about 20 percent of its revenue through exclusive forums, roundtable discussions, and other “in real life” events; and the Chattanooga Times Free-Press has turned hundreds of its readers into paying customers at events like the Ho Ho Expo, a holiday shopping festival hosted every December. Not all media event businesses are run by membership-model news organizations, and not all of them are entirely distinct from editorial content (see: The Texas Tribune), but these event strategies clearly stand to benefit from effective engagement with readers and members, another example of how community can be a commercial product of journalism and not just a side-effect. Ben DeJarnette is the Associate Editor at MediaShift. He is also a contributing writer for the University of Oregon School of Journalism & Communication’s Agora Journalism Center, the gathering place for innovation in communication and civic engagement. 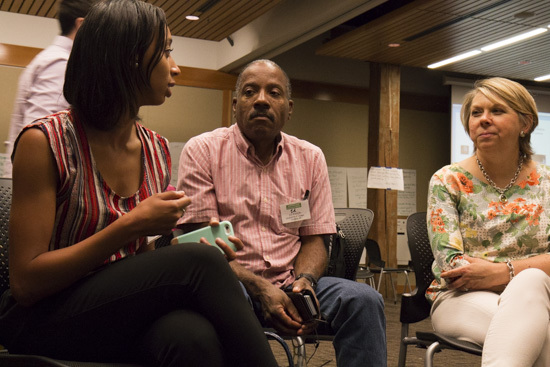 On Oct. 1-4, the Agora Journalism Center and Journalism That Matters partnered to host Experience Engagement, a four-day participatory “un-conference” in Portland, Oregon. Journalism That Matters has been hosting breakthrough conversations about the emerging media ecosystem for more than 15 years.